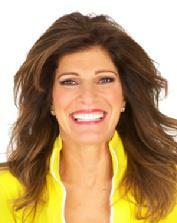 Leslie is a nationally recognized fitness expert, and creator of the Walk at Home program. Her philosophy is simple. She believes that our bodies were made to move and we can walk our way to health and wellness. FITNESS WALKING has proven to be the most beneficial of all healthy lifestyle choices in reducing disease and improving the quality of life! For 25 years, she’s taught people of all ages how to get fit, stay fit and feel better about life. What started as a few classes in her fitness center has grown into the no1 walking program in the world, grossing over $250 million. Leslie’s energy is contagious. Her enthusiasm for walking, and life, is unmatched. She’s a walk guru on a mission: to promote healthy lifestyles, to ward off illness associated with obesity and sedentary lifestyles, and to improve public health one stride at a time. Leslie’s life’s work also includes being a mother of three. So when she’s not leading walk events, producing DVDs, making TV appearances, or supporting national health programs, she’s busy keeping up with family life! Leslie is a contributing editor to many magazines and Web sites including Woman’s Day, Real Age, iVillage, Family Circle and more! She contributes her time, her expertise, and financial support to health organizations including the American Heart Association, American Cancer Society, American Diabetic Association, and MDA. She served on the Leadership Council for IDEA and holds eight certifications including the prestigious American College of Sports Medicine and Cooper Institute: Group Exercise Leader.